The Scarlets take on Magners League leaders Munster this Saturday at Parc y Scarlets (kick-off 6.15pm) for one of this weekend’s top billing games in the final stages of the race for a top four play-off place. It’s a big rugby weekend for the teams in the top six of the table with results after round 20 giving a clearer picture of who’s in the running for semi-final places. Munster travel to Llanelli after their big European battle last weekend in Brive, knowing a win at Parc y Scarlets could secure them a league semi-final at home. Sixth placed Scarlets must win to keep their hopes of a play-off place alive. The Scarlets will field a strong backs division for the contest with some changes to accommodate returning Scottish international Sean Lamont who comes into the centre alongside Kiwi star Regan King. Wales centre Jon Davies is ruled out as he’s still recovering from a dead leg from the Scarlets last outing against Ulster. Morgan Stoddart and George North provide pace, creativity and power on the wing and Rhys Priestland takes the pivotal role at 10. 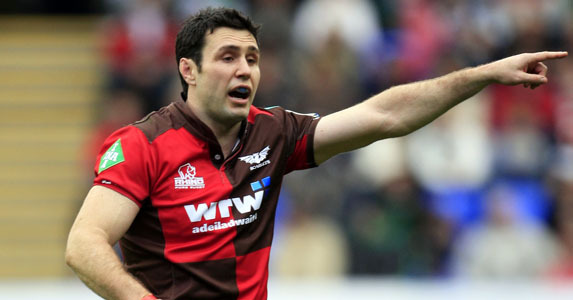 Wales fly-half Stephen Jones is coming back from injuring his wrist against Ulster and will start on the bench. Australian no8 David Lyons returns to the starting line-up after recovering from a knee injury. Ben Morgan is ruled out with slight hamstring strain and Peter Edwards is ruled out with a bruised shoulder. Head Coach Nigel Davies said: “We know Munster present us with a big physical challenge. They’re a quality side and the winning mentality is engrained in them and they have the level of experience and belief to make the right decisions at key moments. Scarlets and Wales skipper Matthew Rees said: “We have to win our next three games and on Saturday we have a tough, physical challenge ahead of us – we know how good they are in the contact area. They are the best team in the league and they’re not top for nothing. They have strength in their squad, they are an old and experienced team that’s gained a lot of success with the players they’ve got. No matter what team they field, they’ll play with confidence and pace. The Scarlets are on 51 points and sit in sixth with Munster already leading the field clear by 12 points. The Scarlets only Magners League defeat at their home at Parc y Scarlets was against Ulster on 18 February. The Scarlets have not beaten an Irish opponent in their last six encounters. Munster have won their last six games in all competitions. The Scarlets have three games left to play against Munster then Glasgow away and then Cardiff Blues at home on 6thMay.